Iran’s leaders cannot stand the thought of talking to the United States and say President Trump cannot be trusted. But Jamshid Moniri, a 45-year old building contractor sweating under the Tehran summer sun, summed up what many ordinary Iranians think. [post_ads]On Tuesday, in Tehran, Mr. Trump’s open invitation seemed to be on everybody’s mind. Increasingly desperate, many say they would welcome any option that could ease Iran’s economic quagmire. The Iranian currency, the rial, has lost 80 percent of its value during the past year — and nearly 20 percent just in the past few days. Foreign investors have left to avoid new American sanctions that take effect starting in less than a week. And almost every week low-level protests over prices or wages erupt somewhere in the country that have the potential to spread if the economic free-fall worsens. But if anything, Iran’s leaders seem paralyzed by Mr. Trump’s offer. When dealing with the United States over the past decades, Iranian leaders have often preferred to do it through secret talks, far away from ordinary Iranians, who are bombarded daily with organized anti-Americanism from their schoolbooks to state television. Ayatollah Ali Khamenei, the supreme leader, who has enshrined anti-Americanism as a tenet of his legacy, made clear after Mr. Trump renounced the nuclear agreement that he would never talk with the American leader. “Trump will wither away, perish, and his body will decompose, but, the Islamic Republic will still be thriving,” Mr. Khamenei proclaimed in a speech. His view was reinforced on Tuesday by the commander of the Islamic Revolutionary Guards Corps, the powerful paramilitary force that is intensely loyal to Mr. Khamenei. 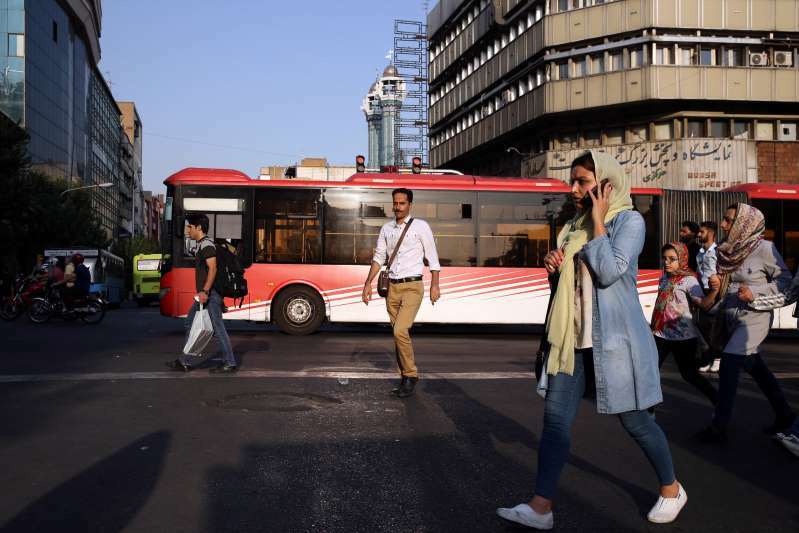 But many ordinary Iranians said Tuesday that they thought direct talks with Mr. Trump could be a pathway to solving Iran’s most pressing problems. Sitting behind the wheel of a Peugeot 206, a French car produced in Iran, Ghader Safarzadeh explained that he thinks of himself as a patient man. His spotless car resembled his well-kept black mustache. Living off a dwindling pension, Mr. Safarzadeh works a couple of days a week as a taxi driver. He calculated that with the rising dollar, a cab ride that last year earned him the equivalent of $5 now made him $1.50. “We can’t live like this for very long,” he said. Priced in rials, the costs of houses and cars have quickly doubled. At the Allaedin mobile phone bazaar, an iPhone X now costs four times more in rials than a year ago. People fear their wages in the Iranian currency could soon become practically worthless. The French school in Tehran is seeking teachers from abroad, but can offer a salary of only 20 million rials, or $200, a month. There seemed no doubt in Mr. Safarzadeh’s mind that his leaders must talk to Mr. Trump. “What should be first is the economic welfare of the people,” he said. Others said they had no idea who to trust anymore. “They are both bad, Trump and our leaders,’’ said Shahnaz Bagheri, a widow in her 60s. The past year had been tough for her. Her husband died after a long illness, Mrs. Bagheri said, and she has been overtaken by economic worries. “Sanctions, devaluation — what should come of us?” she said. For Mrs. Bagheri, Mr. Trump and Iran’s ruling establishment are doing the same disservice. Still, Mrs. Bagheri expressed doubt that direct talks between Mr. Trump and President Hassan Rouhani of Iran would automatically help improve the lives of ordinary Iranians. The economic problems, combined with dozens of corruption cases that have exposed high-level greed, have made it difficult for Iran’s leaders to convince people that talking to the United States is a bad option, something supreme leader Ayatollah Khamenei highlighted in a speech two weeks ago. Iran’s leadership has been trying to show the appearance of unity, and has taken on a defensive posture. Faced with the unpredictable Mr. Trump, both President Rouhani and several commanders warned that they could close the Strait of Hormuz, a key passageway for global oil traffic, whenever they like. But not everybody believes that would accomplish much. Rumors are swirling across Tehran that secret talks with the United States have already begun. On Friday the foreign minister of Oman, the Persian Gulf sultanate that hosted the secret meetings between Iranian and American officials that led to the nuclear talks, may visit Tehran. The minister, Yusuf bin Alawi bin Abdullah, was in Washington last week. Some Iranians have expressed hope that Russia, which supports the nuclear agreement and has sought to strengthen strategic ties with Iran, will help cushion the effect of reimposed American sanctions. Still, Russia-Iran relations have their own tense history. The countries are rivals in oil production. Many Iranians mistrust Russia over what they view as its past failures to honor agreements on arms sales and energy.